FS Templates have released a new theme for Joomla called Grauaze. 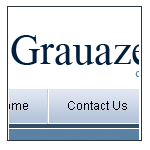 Grauaze is a classic looking business type theme with a hint of modern day style. It's primary colour is blue and it has a flexible one, two or three column layout with nine fully collapsible module positions. The theme is tableless with valid XHTML and CSS. It also comes with the Photoshop source file in case you wanted to change anything. Click here for more information, a demo or to purchase the theme.